The latest - after last year buying France-Soir, the country's smallest daily, for €50 million, shipbuilder's son Alexander Pugachyov is now spending a further €20 million on a marketing campaign to take it mainstream. He's upping the print run by 20 times, has halved the cover price and has more than doubled newsroom staff from 40 to 100. Jealous? There's no part of this that makes immediate sense. In fact, contrasted with the cutbacks, climbdowns and contraction many parts of the industry are seeing, it looks like madness. The Pugachyov scenario in France mirrors that of Alexander Lebedev in the UK ... The former KGB agent took the London Evening Standard, whose circulation was falling, off DMGT's hands for just a nominal fee, forewent cover-price income in favour of free distribution on a higher print run, and pledged a £25 million investment over three years. "£25 million investment??" That's unheard of in today's news publishing economy... Now Lebedev's set to repeat the act by buying The Independent. I think I can help Mr Andrews understand what's going on. It has nothing to do with "saving journalism." These are prominent publications in their country. They are being bought not to make money but as vehicles to influence politics and society. It's not the first time this has happened. Hearst used his newspapers for political influence, and many others have done the same. The Russians, in particular, understand the power of media. 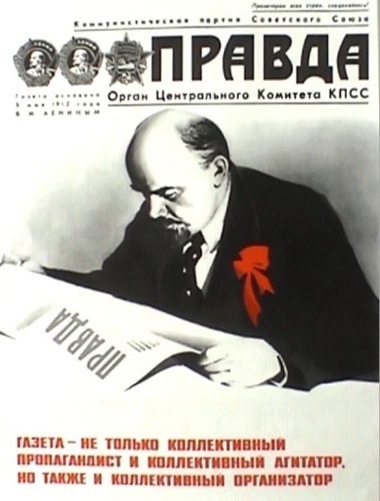 At the heart of the Bolshevik party was its newspaper, Pravda. The Bolshevik party wasn't investing in journalism when it funded and published Pravda -- it was investing in having its ideas discussed in society, and in the political realm. These are ultra-rich individuals, they aren't buying the publications as investments in that business, but as an investment that will aid their other businesses. Mr Andrews notes that Alexander Pugachyov is the son of a Russian shipbuilder and that the French government may place an order for four battleships. I think that's a pretty big clue that the investment isn't about "saving journalism." Media businesses are often loss-leaders that help drive other businesses. You see this today a lot. Most online media sites, especially blogs, don't make money from online advertising but from selling other things, such as services, or research reports, hosting events, etc. You don't make money directly from the traffic. I already have a loss leader, I just need to add services and products that I can sell to help support my journalism. That's why I've started to do some consulting for companies such as Intel, Pearltrees, SAP, and others. Let me know if you need some help on media/business strategies - 415 336 7547.